The fiery middle of a feud sandwich. People who don’t love this image: what’s it like being awful? Peter Parker aka Spider-Man, played by Tobey Maguire. Or perhaps more accurately, voiced by Tobey Maguire and played by Tobey Maguire’s stunt man and also some CGI. 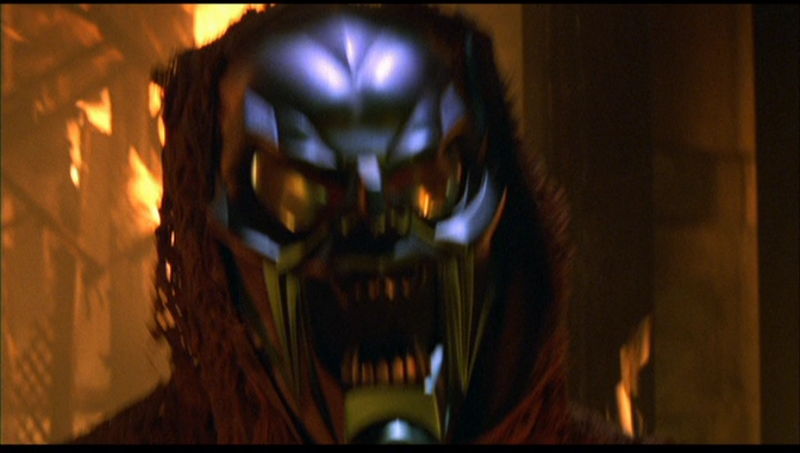 Norman Osborn aka the Green Goblin, played by Willem Dafoe. Armed with: Interestingly the Goblin’s trademark glider does not play a role at all in this fight, but he did bring along some specialized metal spheres that turn into flying circular saws– each one having four metal blades spinning at a high rate of speed and apparently have some sort of A.I. because they’re able to hone in on the correct target for multiple passes. Completely ridiculous but the guy’s a supervillain, so why not? The Setup: After a mirror confrontation revealed the truth to Norman about his split personality (and lead him to gradually merge with it), he decides to track down his greatest threat, Spider-Man. Which is interesting because up until now, the Goblin had only acted to wipe out threats to Osborn’s business; as long as he kept out of sight from then on, Spidey wouldn’t be a threat to him. Anyway, villain confronted hero at the Daily Bugle office and gassed him into paralysis, making him the offer of an alliance rather than a rivalry. He gives him some time to think about it, and he’ll get back to him. 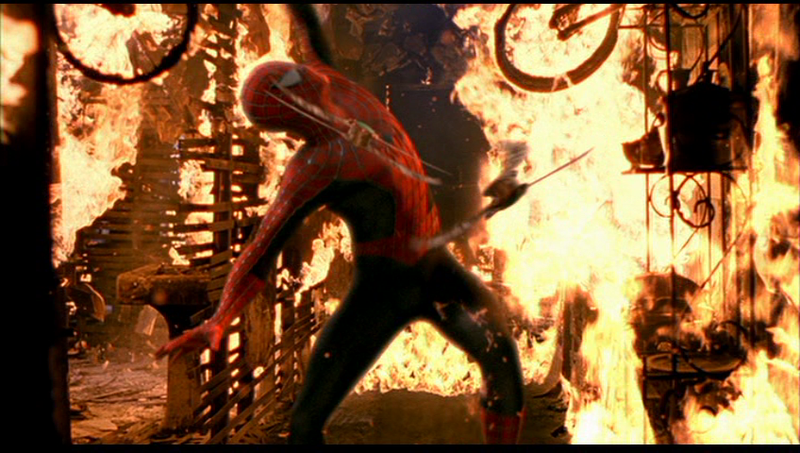 Later, Spider-Man arrives at the scene of a burning apartment building. A woman outside shrieks about her baby still being trapped inside (what is it with people in movies who leave their babies inside burning buildings? I understand being in a hurry but shouldn’t your baby be the FIRST thing you grab on the way out? Even before your pants? ), so naturally our hero retrieves the poor thing. After an awkward confrontation with the cops outside, more shrieks are heard, so Peter swings back in for another rescue. But as he approaches the robed figure with its back turned to him, SURPRISE! Still better than getting Rickrolled. 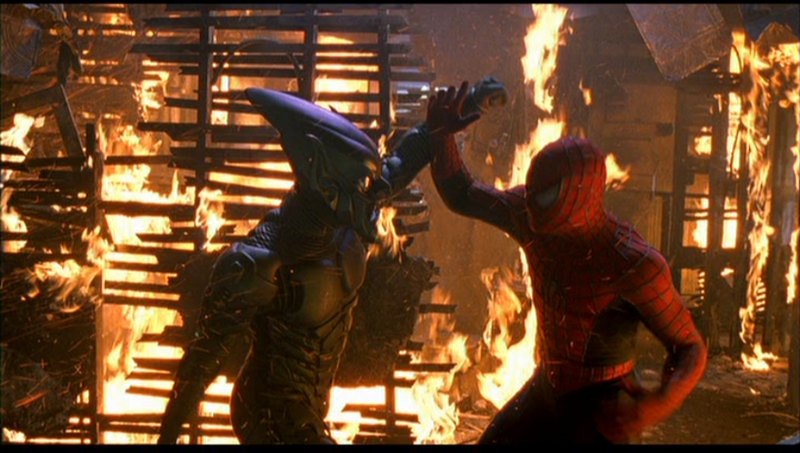 The Fight: You have to love the Green Goblin. He waits until there’s a big fire in broad daylight, then goes to the trouble of sneaking inside a burning building– portions of which could collapse at any time– just so he can confront and if necessary kill Spider-Man. That’s stupidly, wonderfully convoluted. New York’s a big city– how many fires did he hover around before this one just hoping his nemesis would show up? Or maybe HE started this fire (and possibly many before it) just to get Spidey’s attention? That’s terrible and bonkers and I love it. “Gobby” is none too pleased with that answer (perhaps because he was out-hammed for a moment), and starts tossing out the blade projectiles he was already preparing behind his back. Spider-Man immediately sets to contorting his body to dodge them–it ends up being five in total– during an extended slow-motion sequence. It’s fine, if a little Matrix-y. As soon as he avoid them all, the Goblin leaps in and starts beating on him, then they break as Spidey ducks a couple of the projectiles whirling back around at him from behind. When the two resume fisticuffs, the hero starts coming back pretty hard with a few blows and knocks him back. He’s even more impressive when he starts swatting the pinwheeling blades out of the air, though the third one manages to slice him on the arm first. 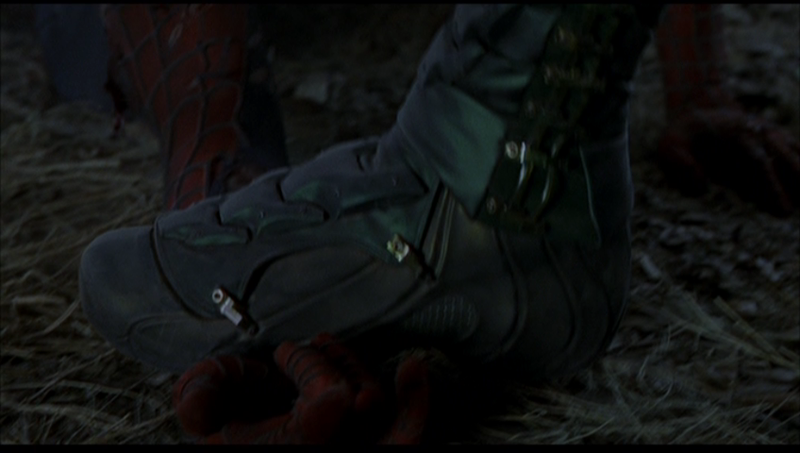 Raimi takes a moment to zoom in on the wound, which is smart because that’ll be a plot point pretty soon. Oh, don’t be such a sissy. Spider-Man gets rid of the last two projectiles by bending far over backwards as they fly at him from either direction, letting them collide in mid-air and explode harmlessly. It’s kind of neat that they kept track of how many of those things were active at once and where they’d be coming from, especially in light of the obvious continuity error in the carjacker fight. 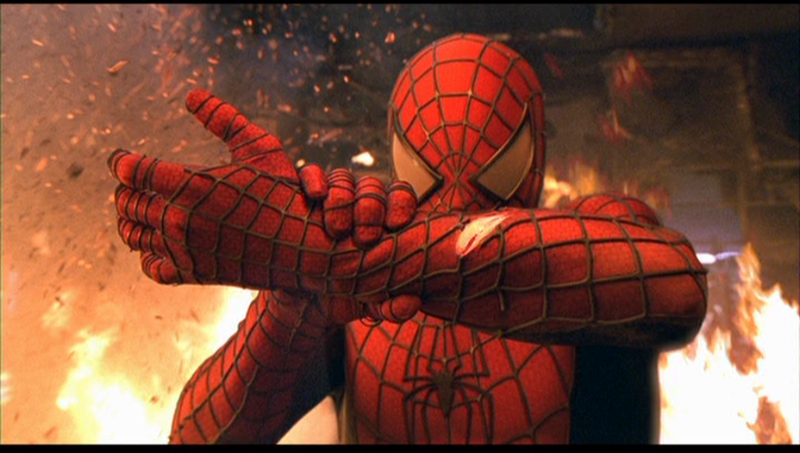 The villain rushes in again but the spider nails him with another big punch, and even as the force of it flings the Goblin backwards Spider-Man snags him with a web and pulls him back for a follow-up kick– a tactically smart way that uses the hero’s unique abilities to keep up the pressure while his opponent’s still unbalanced. Raimi & co were certainly faced with a lot challenges when it came to transitioning the one-moment-at-a-time fights of the comic panels into continuous action the audience can see all of, and they came up with some pretty clever stuff. They’re separated again as the kick sends Osborn through some wreckage, and when he rises he sees that Spider-Man has left the building, the condition of which is deteriorating rapidly. “No one says no to me!” he shouts impotently. He just got kicked through a pile of fiery debris and his main beef is being turned down? Yeesh. This is very short, though of course that fits the skirmish-y nature of it. Even with the slow mo it’s all over in a minute or two. But for being so short it’s packed pretty well with some unusual beats and a nice change-up. Besides that it’s in a cool setting, conveying urgency and excitement. One of the more fun aspects of the Spider-Man character is that because he’s so relatable and sympathetic, it’s not until you step outside Peter Parker’s POV that you’re reminded he’s a hero who’s really only a hard-luck underdog in his own mind; many of the villains he faces regard him as kind of an unstoppable badass. Peter’s narration & thought bubbles betray to us how terrified he is in most encounters and how narrowly he keeps escaping death, but all his adversaries can think of is how impossible he is to kill. (Similarly, reading team books where you get his nonstop wisecracking but are denied his humanizing moments make him look like quite the unflappable weirdo.) This is something the reboot dropped the ball on, of course, as the new Spidey was never anything more than an annoyance to the Lizard. And that really comes across here, as you can see the Green Goblin perceiving Spider-Man as an even more formidable threat who he will have to use some pretty dirty tactics to defeat; meanwhile we the audience just know him as a scared and lonely kid. This isn’t a great conflict on its own, but it’s good for what it is and it’s a solid stepping stone to the big finish. Random Observation: You don’t find out until the next scene, but this fight does, in fact, take place on Thanksgiving Day (perhaps the fire was started by someone cooking a turkey catastrophically wrong? My money is on the baby-forgetting lady). All the main characters gather at Peter & Harry’s apartment for dinner, and Norman guesses Peter’s alter ego when his telltale wound bleeds through his shirt. Wouldn’t the overwhelming smell of smoke have given it away first? And hey, this post is going up the day before Thanksgiving! I swear I didn’t plan that out beforehand. Coming Attractions: Is this the end of Spider-Man?